In June of 1953, Fair Haven Christian Church had its first church service. It was held in Charlie Brackman’s living room. There were 64 people there so the kids had to sit on the stairs. Five families attended, including the Allen’s, the Coy’s, the Brackman’s, the Hook’s, and the Burgett’s. Orville Coy donated the land for the original church, a piece of land high on the corner of State Road 135 and 300 South. Orville and Dorothy Coy were also some of the key organizers. The first preacher ever hired was Art Guy. Noble Turner built an apartment over his garage for him. Art’s first child was born there. He had two children overall. The church building was finished in September of 1954. It was all donated labor. Some workers didn’t even go to the church. The whole congregation helped. The ladies cooked and prayed much. The men came after working their day jobs and brought their sons, too. One of the boys, Richard Agnew, was among them. His parents owned and ran a greenhouse, and so he knew landscaping. He thought of the idea to put the church at an angle facing northeast. Then one day, when the men were working on the ceiling, someone dropped a nail and it hit Richard in the eye, blinding him. It was the thing they hated the most. Fair Haven was founded after disagreements with Trafalgar Christian Church resulted in a breakup. They disagreed with what Trafalgar Christian was teaching. Trafalgar Christian was being run by The Disciples of Christ, an organization which told Trafalgar Christian what to give to missions and what to teach. Trafalgar Christian didn’t even want kids around because they thought the kids would mess up the carpet. Fair Haven wanted to teach what they wanted to teach and not have an organization like The Disciples of Christ ruling over them. Fair Haven separated from Trafalgar Christian Church with strong opposition. Fair Haven relocated to a new location in 1998 along 300 South where they currently reside. Everyday is happy day in the Blue Lounge. 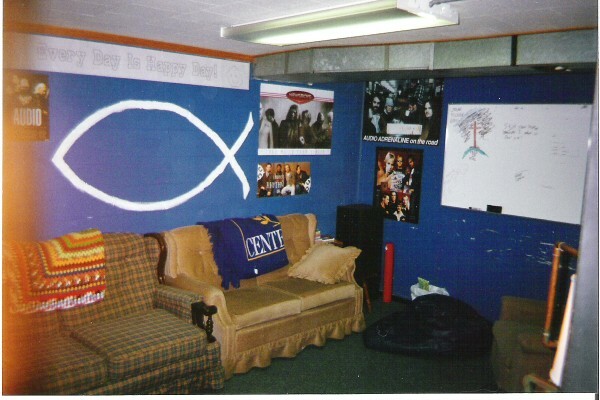 The Blue Lounge was the high school Sunday school room in the basement of the old church. At the height of it’s glory it had two couches, a stereo, a fridge, and a Nintendo Entertainment System. It was named after the blue paint, which was chosen by Jeff Wise, the youth minister at that time, who was an avid University of Kentucky fan. It was rumored that Kentucky Christian College had a similar room, but no room like that was ever found. The room was often used as a hiding place during normal Sunday morning church and it’s growing collection of electronics, wine corks, and “big metal” caused a growing divide between high schoolers and church leadership. Eventually a lock was placed on the door and the wine corks were removed (because they smelled like wine). The giant chunks of metal were taken to the recycling center and the electronics were outdated over time.